I installed CentOS 6.7 from the full install media on a desktop machine at home. sshd has been reconfigured for private key authentication only. When I go to log in via SSH from my laptop (OS X Yosemite, on the same local network) to the linux box, it will only work when I have actually logged in via Gnome locally. There is no authentication error, it just blocks and eventually times out. Once I log in locally via Gnome, I can log in remotely. As soon as I log out via Gnome locally, the remote SSH connection is blocked again (including open connections). If I log back in locally, connections are unblocked again. I have never had this problem when connecting to headless remote servers (AWS, other VPS providers). Why is a remote login being blocked without the presence of a local login? Here is all the relevant config (I hope). drwx------. 2 chris chris 4096 Sep 16 09:25 .
drwx------. 35 chris chris 4096 Sep 16 11:28 .. This happens because of your NetworkManager settings for the network interface. By default, for a wireless connection such as yours, "Available to all users" is disabled by default. This is enabled by default only for wired connections. When set, these settings cause the connection to be activated at boot time, rather than being associated with a user, in which case they are only activated when that user logs in at the console. Solved. 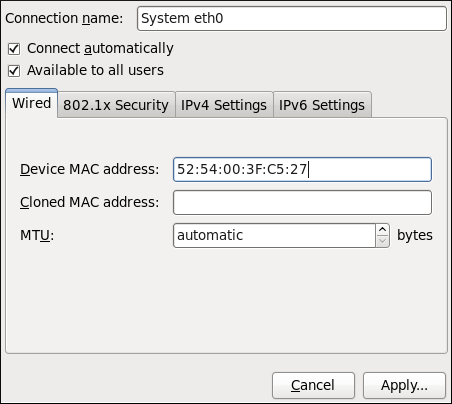 The problem lies in that the network connections were configured by NetworkManager, which Gnome doesn't start until a login has happened. It also tears them down when you log out. Uggh. No more NetworkManager, no more problem. Not the answer you're looking for? Browse other questions tagged ssh centos6 or ask your own question. sshd on mac does no longer accept connections in inetd (-i) mode, but does in do not detach mode (-D), how to fix? How to use the ssh server with PAM but disallow password auth?